Back in 1981, rioting was rife in the UK especially in places like Glasgow, Toxteth in Liverpool and various parts of south London. I remember driving home from a gig in Streatham and driving through the centre of Brixton High Street and looking in my rear view mirror only to see a mass of people heading towards me hurtling bottles and bricks at shops and cars, at that point I decided to floor it, straight through a red light and get out of there. Brixton is now a very different place, but one road just off the High Street was once the life and soul of the area and its called Electric Avenue. It was the 1981 riots that inspired Eddy Grant to write a song about it. Eddy was born in Guyana in 1948 and in the late fifties his parents, without Eddy, moved to the UK but regularly sent money back to Guyana for Eddy’s education. In 1960 he emigrated to the UK to join his parents in Kentish Town, north London. His musical career began as a trumpeter with a school orchestra in Camden and then in 1965 he formed the Equals, a multiracial five piece who charted eight hits in two years including the 1968 chart-topper Baby Come Back. They weren’t the first multiracial group to top the UK chart, the Foundations had got there a year earlier. Electric Avenue is so named because it was the first street in the area to get electric lighting in around 1897. In the early 20th Century was the focal point of Brixton High Street and was the street with all the Christmas decorations. Eddy also wrote and produced songs for other reggae acts including the Ethiopians and The Pyramids and following a serious car accident and a heart attack, Eddy left the Equals in 1971 to concentrate solely on producing. Eddy was back performing as a solo artist first charting with Living on the Frontline in 1979. He had a good run of hits in the eighties including the number one I Don’t Wanna Dance, following it up with Electric Avenue, but how did a Guyanian-born north London boy end up writing about a thoroughfare in south London? Eddy explained, “After I left the Equals I had very little to do and the great British actor Norman Beaton had something going on at the Black Theatre in Brixton which was then called The Dark and Light and I went along and was under him learning some acting. One day I went out for a walk and I just happened to see a sign that said Electric Avenue and I thought, ‘what a great title for a song. '” In 1981 Eddy headed back to the Caribbean to set up a new studio but the airline lost all his luggage which contained a number of songs he’d been working on. “As you can imagine, I immediately went into panic mode because I was being pushed by the record company to deliver and they thought I’d taken the money and done a runner, so I had to hurry along and write some songs together quickly and wrote I Don’t Wanna Dance and Electric Avenue. I had thought about the place and thought why don’t I just make this song in praise of Electric Avenue.” It was the 1981 riots that inspired the opening line; ‘Down in the streets there is violence and a lots of work to be done’. In the UK the song zoomed to number two, in America it took its time. Reggae has never been a genre too well receive in the States, Millie was its best attempt when My Boy Lollipop reached number two in July 1964. 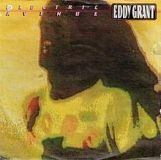 Electric Avenue was released in April of 1983 but it was only when MTV broke their policy of not playing black music videos and thus sticking Michael Jackson tracks on heavy rotation to a welcomed reaction and then adding many other black artists, including Eddy Grant, that the song took off like a rocket to number two spending five weeks behind The Police’s Every Breath You Take. In 1991, Eddy lost out to Bob Marley’s family in a bidding war to secure the publishing rights to the reggae legend’s back catalogue, four years later he was in battle again this time with a record company who wanted to take over the rights to his own back catalogue, but he managed to stay in control. Electric Avenue enjoyed a fairly rare example of the same song making the top five twice when in 2001 a Peter Black re-mix of the song was back in the chart at number five and spent a further 14 weeks on the listing which is five more weeks than it spent first time around. In 2008, Eddy had a good year because he was invited to play at Nelson Mandela’s 90th birthday concert and on the back of that he achieved one of his lifelong ambitions when was invited to perform at Glastonbury. This year is also turning out to be a lucrative one, Electric Avenue, the street not the song, was granted permission to have its own Christmas lights and Eddy was invited to perform the grand switching on ceremony on Monday 17th October. He also did and Q & A session afterwards and signed copies of his latest album, his first in 10 years, Pleasanse. He said of the day, “It’s a huge privilege to return to London, the city where I grew up, to be the guest of honour for switching on the lights at Electric Avenue — the street that has great cultural significance, not just for inspiring my song. The street has truly returned to its former glory and will be a great hub for the local community.” It had also been mooted that Eddy will be receiving a lifetime achievement award from the government of Guyana. Well-deserved and not before time.